Dear hearers of God’s powerful Word: Grace, mercy, and peace to you from God the Father and our Lord and Saviour Jesus Christ. Amen. The Word of Jesus has power. He teaches and He astonishes because His Word has authority. He rebukes and demons are silenced and cast out. He rebukes and fevers leave. Of course the people of Capernaum wanted Jesus around. They wanted their sick to be healed. He was performing miracles among them and they wanted to keep Him from leaving. But Jesus said that it is necessary that He leave. He was sent by God the Father to preach the Good News of the Kingdom of God. He was not sent by the Father to perform miracles, to heal, or to cast out demons. This is the same thing Jesus taught last week when He was asked to heal people in His own hometown but did not do it. Instead, Jesus responded by saying that there were lots of widows in Israel starving to death in the time of Elijah, but God sent Elijah to a widow that was not an Israelite, and God provided only for her. So also there were lots of lepers in the time of Elisha, but God sent Elisha to heal Naaman the Syrian while the lepers among God’s people suffered and died. The purpose of God is not to heal everyone from their illnesses or to take away all suffering in this life. The purpose of God is to take us from this life to the next life; to eternal life. Our problem is that we want to cling to this life. We want health. We want healing. And really, let’s be honest we want a whole lot more than that. We want wealth, too. We want luxury. We want leisure and comfort. We want what the world offers. We want to stay in this world for as long as we can. We spend so much of our time and energy trying to improve our lot in this life. Why? This world will pass away along with its desires (1 John 2:17). It is stored up for fire (2 Peter 3:7). We have a new heavens and a new earth promised to us (2 Peter 3:13). Why would we be so attached to this old earth that is filled with sin, suffering, disease, death, and godlessness? We have a new heavens and a new earth promised to us where righteousness dwells (2 Peter 3:13). That means no more sin. That means no more suffering. No more disease. No more death. No more godlessness. We need to stop treating God like He’s Santa Claus, where we give Him our wish list and He gives us what we request, because we do not know what to ask for as we ought (Rom. 8:26). We ask and do not receive, because we ask wrongly, to spend it on our passions (Jas. 4:3). Why are we striving so hard for things that are stored up for fire? If we cannot release our grasp on the things of this world, there is great danger that we will still be clinging to them when the fire comes. No, it is not a sin to ask for what we need. It is not a sin to pray for healing. But know that God will give you something better than that for which you pray. He may not give you that for which you ask because He wants to tear you away from your attachments to this life, for your eternal good. He may not give you the healing for which you pray because He wants to take you to your eternal home now. The reason for Jesus’ miracles, healing, and casting out demons was to prove who He is. They were to prove to you the power of His Word. Since Jesus healed Simon’s mother-in-law of a high fever through His Word, you know His Word has power. You know that when He promises you that all your illnesses and diseases will be healed in the world to come, He actually has the power to do it. Since Jesus proved His power over demons and they had to obey Him, you know that Jesus has power over all the demons that torment you and that they will be cast into the lake of fire for eternity, while you will be brought to the new heavens and the new earth where there are no demons. Since Jesus showed His power to raise the dead through His powerful Word, you know that His powerful Word will raise you from the dead when He returns. Jesus didn’t come for the main purpose of healing and performing miracles. He came to preach the Good News of the Kingdom of God. He came to teach the saving Gospel that brings us into the Kingdom of God. He came into this world, taking on our flesh, to suffer for our sins, so Jesus knows and understands our suffering. He knows and understands our weaknesses and temptations – He also was tempted although He never fell into temptation or sinned. Jesus knows suffering. His entire earthly life was a life of service to us. He served even though He was rejected; even though He was hated and despised. 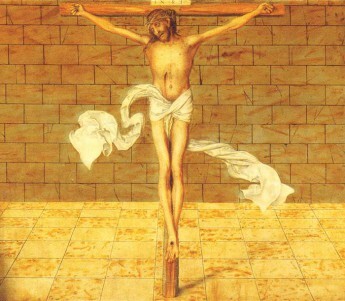 He served to the point of suffering torture and death at the hands of mankind, whom He came to save. Because Jesus knows our weaknesses and temptations and suffering, He gave us His powerful Word. He gave us His powerful Word that points not to healing or miracles or wealth in this life, but to healing and miracles and wealth in the life to come; in eternal life. God’s Word leads us to not cling to this world but to cling to eternal life, which He gives to us. Eternal life is possible for us because of God’s powerful Word. When you were baptized into Christ’s death and resurrection, according to His powerful Word, you were made heirs of eternal life (Titus 3:5-8, Rom. 6:5). When His powerful Word of Absolution is spoken to you, it is just as valid and certain, even in heaven, as if Christ our dear Lord dealt with you Himself (SC V). When His powerful Word is spoken over the bread and the wine, you know that you receive exactly what Jesus Himself has promised – His true body and blood for the forgiveness of sins. But the reason for Jesus’ miracles, healing, and casting out demons was to prove who He is. They were to prove to you the power of His Word. Since Jesus healed through His Word, you know His Word has power. You know that when He promises you that all your illnesses and diseases will be healed in the world to come, He actually has the power to do it. Since Jesus proved His power over demons and they had to obey Him, you know that Jesus has power over the devil and all the demons that torment you and that they will be cast into the lake of fire for eternity, while you will be brought to the new heavens and the new earth. Since Jesus showed His power to raise the dead through His powerful Word, you know that His powerful Word will raise you from the dead when He returns. You know all this because He gives you His powerful Word that tells this to you. You know all this because He gives you His powerful Word which gives you faith to trust that all that He says is true. Amen. What on earth is going on in our Old Testament reading from Nehemiah? It certainly isn’t a normal occurrence these days. In fact, it’s quite bizarre. All the people of God gathered together like a huge mob. They weren’t rioting but they were making demands. They demanded that Ezra the scribe read the Scriptures to them. Not just one or two lessons, but from early in the morning until midday. The people gathered together as one man and demanded that Ezra and the Levites do their job and read the Scriptures to them, and explain the Scriptures so that they could understand. And they did this for some six hours. What on earth would possess these people to make such a demand? Why were they so intent to hear God’s Word? Weren’t there other things they’d rather be doing? The reason is that God’s people had been through quite the ordeal. They had been living their normal lives, going about their business. As time went on, they got busy with things other than hearing God’s Word. As time went on, they got caught up in worldly things. They got caught up in idolatry. They fell into adultery and other kinds of sin. God sent His messengers to warn them to turn from their sin. But they thought that they could do whatever they pleased, and because they were God’s people, God would just overlook and ignore their sin. God sent His messengers to read His Word and to explain it so that the people could understand, but the people didn’t care to hear it. After all, life was good. They saw no sign that God would do anything about their indifference to His Word. To top it off, there were false prophets who preached and told the people that everything was fine. Jeremiah records the message of the false prophets, “They say continually to those who despise the word of the Lord, ‘It shall be well with you’; and to everyone who stubbornly follows his own heart, they say, ‘No disaster shall come upon you.’” (Jer. 23:17) These false prophets were telling the people what they wanted to hear. Just follow your heart. Do whatever you want. Don’t follow God’s Word. Everything is going to be just fine. Don’t listen to the preachers who tell you to turn from your sin. Still God was patient. For decades, God still sent His preachers with His Word. He still sent His messengers to warn the people to turn from their sin and to warn the people that these false prophets were not speaking God’s Word but their own tales. God sent warning after warning but to no avail. The people did not want to listen to God’s Word. As a result, God gave them into the hand of the Babylonians. King Nebuchadnezzar of Babylon defeated them in battle. He destroyed their cities. All their architectural marvels were demolished to rubble. He even wiped out much of the natural ecosystems in their land. Nebuchadnezzar exiled all the royalty to ensure there would not be an uprising against him. He forced the soldiers he hadn’t killed into his own army. All the artisans, craftsmen, musicians, and any other skilled trades were forced to serve Nebuchadnezzar. The rest were left to work the vineyards and the fields to yield revenue for Nebuchadnezzar. Nebuchadnezzar even destroyed the Temple, meaning no more sacrifices for the forgiveness of sins. Zedekiah, the king of God’s people, was blinded before he was bound and exiled to Babylon. But he was forced to watch one last horrific thing before he was blinded, which was the last thing he ever saw: his sons were slaughtered before his eyes, and his royal line was thus ended. The exiles in Babylon saw a future with no hope. They had turned their backs to God and now they were exiled with no hope to ever return home. Their sins had resulted in this horrible situation. If only they could go back and hear God’s Word and do things differently. Their warfare wasn’t just with Babylon; it was with God. It was God who brought this disaster upon them because they refused to listen to His Word. But did God spurn them forever? Did He reject His people forever? No, God did not reject His people forever. He sent them His Word of comfort. Even in exile, God sent His Word through His messengers to the people. God even sent them promises of forgiveness. He still called Himself their God and said that they were His people. God still sent them the message of repentance, but now their hard hearts had been softened and they were ready to hear His Word. And God brought His people back to their own land. God sent Cyrus, king of Persia, to conquer Babylon. Then God turned Cyrus’s heart to send His people home and even to support the rebuilding of the Temple that had been destroyed. In Nehemiah, from where we read, the rebuilding of the Temple had been finished, the walls of Jerusalem had been rebuilt, and the people were back home. The Temple sacrifices could resume. The feasts and festivals of God could resume. And the people wanted to hear God’s Word. They didn’t want a repeat of the exile or the destruction of their cities, so they demanded that Ezra read the Scriptures to them. They were ready to hear God’s Word for hours at a time because now they understood the value of God’s Word. No longer did they want to follow their own hearts because their hearts had led them into sin and exile. No longer did they want to follow false preachers who encouraged them to do whatever they wanted because that had led to death and destruction. God used this horrible destruction and exile to crush the pride of His people. He turned them away from their sins back to Himself, and He forgave their sins. Let us pray that we do not need such a harsh lesson to turn away from our sin. We have the great gift of God’s Word. Let us be more willing to hear it and learn it now than God’s people were before the Babylonian captivity. God is merciful and gracious, slow to anger and abounding in steadfast love. He wants us to turn from our sins and receive forgiveness, because He loves us. He sends His messengers to warn us of the dangers of sin so that we would avoid the horrible consequences of sin. God has gone so far to save us from our sin. He’s gone to the point of sending His only Son to die in our place – Yes, to die for us who have rebelled against Him and His Word. We who have neglected and despised His Word are given the forgiveness of our sins. We who have followed our hearts instead of God’s Word are shown mercy and steadfast love instead of punishment. If we harden our hearts to His Word, He may even destroy our nation and lead us into exile to soften our hearts so that in the end we will be ready to hear His Word and receive His forgiveness. God has already accomplished everything for our forgiveness. Jesus’ death has paid the price of our sins. God gives His forgiveness to us freely, without any merit or worthiness in us. He baptizes us into His name and calls us His people even when we struggle to do what is right. He absolves us of all our sin with His Word that declares us righteous. He gives us the true body and blood of Jesus to eat and to drink so that we would remain in the faith and be strengthened in it, even if we have to suffer in this world of sin. And God has given us His precious Word. In His Word He tells us of His love for us in Christ Jesus our Lord. In His Word He tells us that He is our God and we are His people. The more we hear His Word, the more we want to hear. The more we hear, the more we understand and the more attentive we are to it. God’s Word is a great and precious gift for us to treasure and read and hear. I pray that you will demand from me that I read you more of God’s Word; that you will ask for longer sermons and longer Bible classes; that you would gather like a mob and demand that I read to you all morning. I pray that God would instil in all of us a great desire to read and hear His Word and save us from destruction and exile. Amen. Dear people for whom Jesus came: Grace, mercy, and peace to you from God the Father and our Lord and Saviour Jesus Christ. Amen. Epiphany means “appearance” or “manifestation.” During Epiphany, Jesus is revealed to us. The Christmas baby is manifested to be none other than God in the flesh. As we heard last week, this was clear in the Baptism of our Lord when God the Father proclaimed Him publically to be His beloved Son in whom He is well pleased and the Holy Spirit descended on Him in the form of a dove. God has come to earth! But what does this mean and what should we expect? John the Baptist, who prepared the way for the coming of God in the flesh preached fire and brimstone. Repent! The axe is laid to the root of the trees! Bear good fruit or be thrown into hell! (cf. Luke 3:9) He went around in a rough garment of camel’s hair and ate locusts and wild honey as he preached. So the Coming One who is mightier than John, what do we expect of Him? More of the same, right? Only mightier and stronger. Yet Jesus did not go around in rough clothing or eat a meagre diet of locusts and wild honey. And the first of Jesus’ mighty signs and wonders did not take place in the wilderness. The first miracle Jesus performed was at a party. And Jesus didn’t raise someone from the dead or heal someone who was sick. His first miracle was giving more wine to partiers who had been drinking all day and had already had plenty to drink. And He didn’t just bring a few bottles of wine to the party. Six thirty gallon jars of water turned into wine would be the equivalent of 907 bottles of wine! And not just any cheap wine, but some good quality wine that made the master of the feast take notice and ask why the good wine was being brought out to the party so late. Is this what you would expect from God in the flesh? Many people back then had trouble with it, too. They called Jesus a glutton and a drunkard, a friend of tax collectors and sinners (Luke 7:34). It all just didn’t seem right to them. But then again, John the Baptist didn’t seem right to them either. Those who had a problem with Jesus also had a problem with John the Baptist. Because John did not eat bread or drink wine, these people said he had a demon (Luke 7:33). John did not join the people in their festivities. In fact, the angel Gabriel told John’s father that he was not to drink wine or strong drink at all (Luke 1:15). But the real problem they had with John was his message of repentance. It had nothing to do with the fact that he didn’t drink wine or strong drink. Those who didn’t want to turn from their sins, responded to John by accusing him of having a demon, even though all he did was bring them God’s Word of repentance – turn from your sins and live. They found excuses not to listen to him, whether it was his clothing of camel’s hair, his food of locusts and wild honey, or the fact that he wouldn’t drink alcohol and party with them. Jesus came with the same message of repentance – turn from your sins and live. And there were many that did. Sinners of all sorts came to Jesus for Absolution. Tax collectors and prostitutes came to Jesus, and He forgave them. Jesus ate and drank with the lowlifes of the earth. This didn’t sit too well with those who didn’t like Jesus’ message of repentance. They didn’t want to repent of their sins, and they didn’t think that tax collectors and prostitutes deserved forgiveness. They didn’t want to turn from their sins, so they responded to Jesus by accusing him of being a glutton and a drunkard. They found excuses not to listen to him, whether it was his forgiving of sinners they didn’t think deserved forgiveness or the fact that He ate and drank at parties. God in the flesh was not what people expected. He was not the rough wilderness man John was, staying away from parties and alcohol. Nor was He socializing with the elites and the nobility to the exclusion of the poor and marginalized. Rather, Jesus ate and drank with all sinners regardless of their social status because everyone needs forgiveness. Jesus didn’t come to bring new laws or to crush us with existing laws. He knew that we are already crushed by the Law. He knew we are unable to do what God’s Law requires of us. He knew that we sin in thought, word, and deed, by why we have done and by what we have left undone. Jesus came to do what we cannot do. He came to fulfil the Law for us. He came with forgiveness and healing for broken sinners. He came to dwell with us, even at our parties. He came to give wine to partiers celebrating God’s good gift of marriage. It may seem like a little thing. Sure, God cares about the big things in our lives. But we see that He cares also about the little things. He cared even that the wedding party ran out of wine. He tells us that even the hairs on our heads are numbered (Luke 12:7). This may not be the God that we expect. A provider of wine and a friend of tax collectors and sinners. But this is the God that Jesus is. He remains a friend of tax collectors and sinners. He continues to call us to repentance – not because He wants to condemn us, but because He wants to forgive us. He bore the crushing weight of the Law so that ours sins are forgiven. His forgiveness to us is as overflowing as His generosity to the wedding couple of Cana. When He gives us His true body in Holy Communion with the bread, we may just eat a little wafer of bread, but that little bread is overflowing with forgiveness. When He gives us His true blood in Holy Communion with the wine, we may just take a little sip, but that sip is overflowing with forgiveness – more than 907 bottles worth. Because Jesus does not just give a little bit of Himself to us in the Lord’s Supper. He gives all of Himself to each of us, just like He gave all of Himself to death for our sins. This may not be the God we would expect. But since when has God abided by our expectations? Through turning water into wine and His many other mighty signs and wonders, Jesus manifested Himself to be God. His resurrection from the dead proved to be His ultimate mighty sign as He proved Himself victorious over sin, death, and the grave. You have God’s invitation to this eternal banquet, and you can rest assured He’ll be serving more than 907 bottle of wine, and it’ll better wine than you’ve ever had. Amen. In the Jordan River stood the one man in whom God the Father is pleased. Jesus is the one man who never sinned, thus He is pleasing to the Father. He is the only man who does the will of the Father, thus He is pleasing to the Father. The crowds that came to be baptized by John came to the baptism of repentance. They had sinned. They came, turning away from their sins and desiring to receive forgiveness. They came with their baggage of greed and jealousy. They came with their sins of anger and slander. They came with their iniquities of adultery and theft. God the Father could not be pleased with them based on what they had done. There was nothing pleasing in any of them. On the one hand, God the Father is pleased in Jesus, and on the other hand, God the Father is not pleased in the sinful crowds; He is not pleased in sinful mankind. See, we must group ourselves in there with the sinful crowds. Either we group ourselves with the sinful crowds who are repentant and desiring forgiveness, or we are with the sinful crowds who are not repentant and thus will not receive forgiveness. You cannot receive forgiveness for sin to which you cling and which you do not want to give up. You cannot receive forgiveness for sin from which you refuse to turn away. But turning away from sin isn’t enough. A desire to do better isn’t enough. We cannot undo our sins. We cannot avoid falling into sin again even if we turn away from it. We cannot make ourselves pleasing to God the Father. This is where Jesus comes in. This is where the only man who is pleasing to the Father comes to the rescue. This is the very reason He was baptized by John in the Jordan River. Jesus had no sins of which He needed to repent, yet He stood with the crowds of sinners to receive the baptism of repentance. Jesus came to take our sins on Himself. That’s why John points to Him at His baptism and says, “Behold the Lamb of God who takes away the sins of the world.” (Jn. 1:29) Jesus took all the sins of the whole world onto Himself and God the Father announced publically that He is pleased. The Father is pleased that Jesus is taking away the sins of the whole world. The Father is pleased that Jesus is taking responsibility for every sin ever committed. The Father is pleased that Jesus is baptized for us, to make Baptism a life-giving water for us, rich in grace, and a washing of the new birth in the Holy Spirit (Titus 3:5-8; SC IV.3). Through Baptism, your sins no longer keep heaven closed to you. Rather, as the heavens opened at Jesus’ Baptism, so the heavens are torn open to you through your Baptism into Christ. As the Holy Spirit descended on Jesus at His Baptism, so in your Baptism, the Holy Spirit descended on you along with all of His gifts. In your Baptism, because you were made heirs and children of God, God the Father says to you, “You are my beloved son; with you I am well pleased.” God is pleased with you because Jesus has taken your sin and covered you with His righteousness in your Baptism. Your Baptism was a public announcement to everyone that you are claimed by God. It was a public announcement by God that you are His and that He is well pleased in you. Not because of anything you have done, but because you are baptized into Christ. This may raise some questions. If Baptism is such a wonderful gift and all of this truly happens in Baptism, how can it be that so many people who were baptized have fallen away from the faith? If these people were claimed by God through Baptism and publically announced to be pleasing to Him how can it be that they are no longer pleasing to God? Does God change His mind? Does God forget His beloved sons with whom He is well pleased? This is where we can go to the Small Catechism for the answer. The Small Catechism is a great treasure for the Church. It is a summary of what the Bible teaches concerning the most important matters of faith. It is simple and condensed so that it is easy to memorize. It is easy for the father of the household to go through the Small Catechism daily with his family to teach them the most important things for them to know from Scripture. See, there we have our answer. God does not forget. God’s promises aren’t voided or taken back. Baptism makes you a beloved son of God and makes you well pleasing to Him. But these benefits are received through faith; they are received through believing that these promises of God are true. That’s why we take Baptism seriously. That’s why we exact promises not just from parents when they bring their children to be baptized, but also from the sponsors. They promise that they will teach their child the faith, that they will bring them up in the instruction of the Christian faith, and encourage them to receive the Lord’s Supper. Without this, the baptized child is in great danger. It’s like having a new born baby and feeding him when he is first born, but then starving him of nutrition thereafter. Such a child will physically starve to death, just as a child starved of the spiritual nutrition of God’s Word will starve a spiritual death. Faith will die if it is not nourished. See, it’s not God forgetting His promises, it is the masses of people forgetting God’s promises and walking away from them. It’s not God rejecting His sons with whom He is well pleased, it is His sons rejecting Him as their Father. The promises of God remain in Baptism even for such people, but they do not get the benefits of those promises because they reject them and do not believe them. So if you are a parent, stop spiritually starving your children. Teach them the faith at home. Use the Small Catechism to easily teach them what they need to know. Teach them what their Baptism is so that they don’t wander away from it as they get older. Bring them to God’s house to learn and encourage them towards the faithful reception of the Lord’s Supper. If you are a sponsor, a godparent to a child, fulfil the promises you made at the Baptism of your godchildren. Pray for them. Support them in their ongoing instruction and nurture in the Christian faith. Pick them up and bring them to church if their parents fail to do so. If you are a grandparent or a great grandparent remind your children of the promises that they made before God and the congregation to raise your grandchildren and great grandchildren in the faith. Call on the sponsors of your grandchildren and great grandchildren and tell them to do what they promised God they would do. Don’t be shy in talking about these matters. The great gift of Baptism should not be lost to our children, grandchildren, great grandchildren, or godchildren because we are too shy to speak up for them. Don’t be afraid to extoll the great gifts that Baptism gives. And always remember that the great gifts of Baptism are for you, too. Whatever failures you have in your past to teach the faith; whatever failures you have had in your past as a parent, grandparent, great grandparent or sponsor to do what you promised you would do – all these failures are covered by the waters of Holy Baptism. That’s how great the gift of Baptism is! Because Jesus was baptized for you and has carried all your sins to the cross and died for them, and because you were baptized into Jesus, you have been publically declared God’s son and pleasing to Him. And lest you spiritually starve, Jesus has instituted a meal to spiritually nourish you to everlasting life by giving you His own body and blood to eat and drink for the forgiveness of all your sins. In the Lord’s Supper, God the Father will once again affirm to you, that you are His beloved son in whom he is well pleased and heaven is open to you. Amen. Dear believers who will be exalted: grace, mercy, and peace to you from God the Father and our Lord and Saviour Jesus Christ. Amen. God humbled Himself and was born of a virgin. This is really beyond our ability to understand or comprehend. It is God not coming in all His power and glory, but humbly taking on human flesh. The humiliation of Christ was that He did not always use His divine powers and attributes. We see this most clearly in His suffering and death. Jesus could have simply walked away from the soldiers as they came to arrest Him in the garden, as He had walked away previously when crowds had tried to kill Him. Jesus could have struck them down with a word from His mouth. But Jesus had a purpose, and that purpose was to die for the sins of mankind. He came for this purpose, and He humbled Himself for this purpose. We see the humiliation of the Son of God in today’s Gospel reading also, as He submits to Joseph and Mary. As God, Jesus did not need to submit to anyone. However, according to His human nature, He entered a human family and thus put Himself under the authority of a human father and mother. Jesus gives witness to the order that God intended in creation by submitting Himself to that order. We see the humiliation of Christ also in His increasing in wisdom and in stature and in favour with God and man. As God, Jesus could not increase in wisdom or stature or favour. Jesus is the wisdom of God through Whom the universe was created (cf. Prov. 8; Jn. 1). But in His state of humiliation, Jesus did not fully use His divine powers and attributes. As a man, Jesus did not fully use His divine knowledge and wisdom. Thus He increased in wisdom according to His human nature. He learned. At the same time, we see a glimpse of Jesus’ divinity; we see that Jesus is also God. He astounds the teachers of the law in the Temple as a twelve-year-old boy. His understanding and answers blew them away. He had wisdom beyond comparison. The teachers who spent their lives studying and teaching God’s Word learned from the twelve-year-old Jesus as He opened Scripture to them and as He guided them through questions concerning Scripture. Jesus is still active in His Word, teaching and guiding. The Word of God is not a dead book of mere letters and words. The Word of God is living and active (Heb. 4:12). The Holy Spirit works through the Word to open our eyes to God’s truth and to teach us. That’s why we should be continually immersed in the Word of God. If we don’t continually seek God’s wisdom concerning all matters in our lives, we can easily be swayed by the world’s wisdom and be led astray. If we don’t seek God’s will for our lives from His Word, we can easily make up our own ideas about what God’s will is, even though such ideas may be entirely false. There are always and have always been people who claim to be doing God’s will even though they are blatantly going against what God says in His Word. Such people are not following God’s Word, but rather the devil, the world, and their sinful flesh. According to a recent study by Pew Research Center, 56% of the members of Lutheran Church-Missouri Synod (LCMS) believe that homosexuality should be accepted rather than discouraged. 46% believe abortion should be legal in all or most cases. 45% say they look to common sense for guidance rather than the Word of God. 20% are not certain that there even is a God. It is no coincidence that this ties in with 64% of the members of LCMS not reading the Bible even once a week. I don’t know what the statistics are for Lutheran Church-Canada, but I fear they are equally scary. When you don’t follow God’s Word, the only thing left is to follow the devil, the world, and your sinful nature. This new year, let us make a commitment to read God’s Word regularly. Let us seek the Lord while He may be found (Is. 55:6). Immerse yourself in Scripture every day to learn and to be blessed by the living and active Word of God. All Scripture is God-breathed and profitable for teaching, for reproof, for correction, and for training in righteousness, that the man of God may be competent, equipped for every good work (2 Tim. 3:16-17). Attend the Divine Service to receive instruction and the forgiveness of sins. Come to Bible classes to learn and ask questions about God’s Word. Jesus is in His Father’s house, so come here regularly to receive from Him. Joseph and Mary didn’t understand that Jesus must be in His Father’s house as the Old Testament prophesies. Of course Jesus is to be sought in His Father’s house. This is no different for us today. Why would we seek Jesus elsewhere? He’s promised to be found in His Father’s house, doing His Father’s business. God the Father’s business is forgiveness and He gives it in His house. This was true of the Old Testament Temple where sacrifices were offered for the sins of the people, and it is even more true for the Church where the benefits of the ultimate sacrifice of Jesus on the cross are given out freely. Jesus is present here in His Word, teaching and astonishing as He did in the Temple. Jesus is present here in His body and blood, giving us the forgiveness of sins He earned by giving His body to death and shedding His blood for us. As God and man, Christ has bridged the gap between heaven and earth. He brings heaven down to earth in Holy Communion, and will take us from earth to heaven because of the forgiveness we receive in Holy Communion. Jesus is our Mediator in heaven not just as God, but as man. We have a man, Jesus Christ our Lord, interceding in heaven on our behalf. He speaks for us. He prays for us. As a man, Jesus opened the kingdom of heaven for man. And Jesus is no longer in His state of humiliation. After He died, it was finished. Jesus entered His state of exaltation. He showed Himself victorious over His enemies in hell (I Peter 3:18-19, Col. 2:15). He rose from the dead, defeating death. He ascended into heaven to sit at the right hand of God the Father almighty. He fully uses His divine powers and attributes as He wills especially in giving us His true body and blood to eat and drink and in forgiving us all of our sins. Jesus’ state of humiliation was for us and our salvation. Jesus’ state of exaltation is also for us and our salvation. He suffered and died for us in His state of humiliation. He rose from the dead for us and ascended to the right hand of the Father for us in His state of exaltation. From thence He will come to judge the living and the dead. This also is for us because we already know the verdict of His judgment. We have already been declared not guilty. Not because we haven’t done anything sinful, but because Jesus was Himself judged for us and found guilty of all of our sins. Through our Baptism into Christ, we are in Him and thus we’ve already died in His death. Our Baptism was our death, and that is the only judgment we will receive. Now Jesus returns to judge the world and to separate us from it. He comes to rescue us from the world and its sin and suffering. He comes to rescue us from our humiliation. He comes to exalt us with Him into the eternal joys of the Father. Jesus is in His state of exaltation and will share His exaltation with us. The humiliation we suffer in this world because of our own sins and the sins of others will be replaced with glorious exaltation. Jesus will raise us up with Him into the heavenly places because He suffered humiliation for us, and is now exalted for us at the right hand of God the Father. Our humiliation will soon be over and our exaltation will soon begin. Amen.